Years ago, I used the following recipe to make some really wonderful chicken wings, which my family loved, but was full of unhealthy fat. Times have changed and so have our diets! I have modified it to use lean chicken breast tenderloins and have also reduced the “heat.” It would go great with a side of green beans or broccoli with some healthy brown rice! In a large bowl mix together the ginger, garlic, soy sauce, honey, mirin, vinegar, pepper sauce and sesame oil. Add chicken, stir well and marinade for 2 hours at room temperature. Remove chicken from marinade. On a nonstick grilling pan, spread the oil with a paper towel. Heat the pan over medium heat. Cook each side of chicken about 2½ minutes. Maybe slightly longer for larger pieces of chicken. Chicken will have darker grill marks due to the sugar content of the mirin and honey. Place chicken on platter and serve. 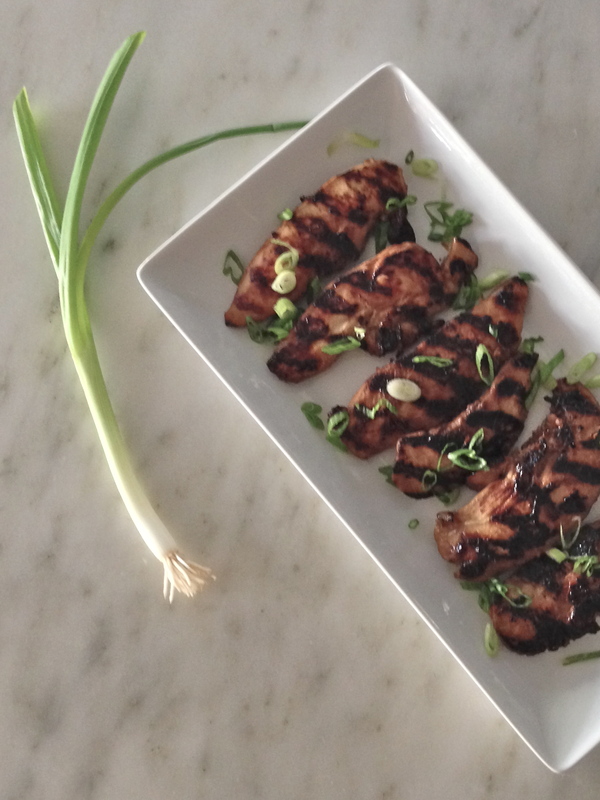 Garnish with sliced scallion. Serves 3 to 4. I love your simple and healthy recipes. I’m trying my best to keep my recipes healthy nowadays, adding more fibers, whole grain, etc. I hope to get help from you 😄. Thank you so much! I am sure there are things I can learn from you and hope to participate in your link party soon!